25 Week Photoshoot with Miss Peyton | Confessions of a "None"
So, Peyton turned 25 weeks last Wednesday. 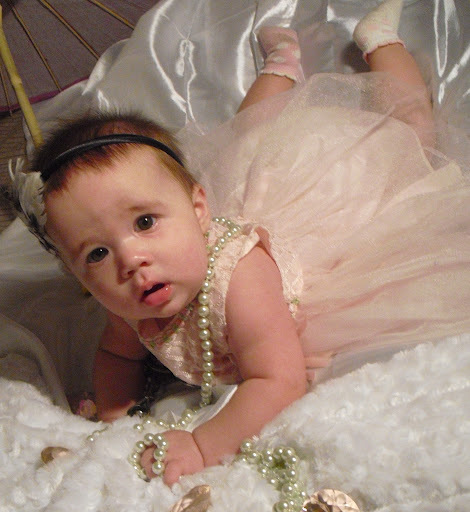 My sister and I came up with the cutest little idea for pictures of her. I couldn’t help but show them off. I am SO proud of this. I am not a photographer in any way, but I think they turned out awesome. If anyone wants to re-create the look, they certainly can. I think it only cost us 20-30 bucks total for all the props. I got the headband from a consignment store here in our city. “Wild Child”, but I think you can find them just about everywhere. 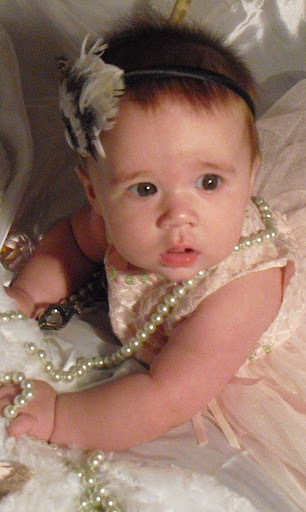 I personally don’t care for the headbands with GIANT flowers on their head, but for some reason, the flat feathers gave my baby girl an old Hollywood feel and I got that inspiration from a post on Pintrest, leading me here. Not where I got my headband, mine was approximately $4.00, but thanks to this site, I got a nice inspiration for a fun photo shoot. I did this photo shoot on my bed, which is why my curtains are on the wall in the background. Frankly, I thought the majority of the pictures were so good, that I didn’t feel like taking the time to edit the background out of them. I got the dress from a woman at work, who handed it down to me. I wasn’t sure if I was going to like it, since its kind of an older model, but it fit Peyton like a charm and frankly, it is ADORABLE. The poofy skirt really works well with the photos we were going for. Hats off to her Mama for the mis-matched socks. I can’t take any of the credit on that one. I actually had no idea her socks were mis-matched until we started shooting the pictures. It adds character. 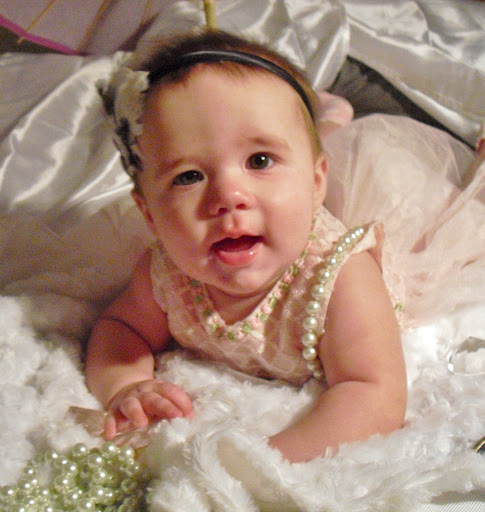 I got the pearls from Walmart as well, wrapped them around her neck and she enjoyed trying to eat them. 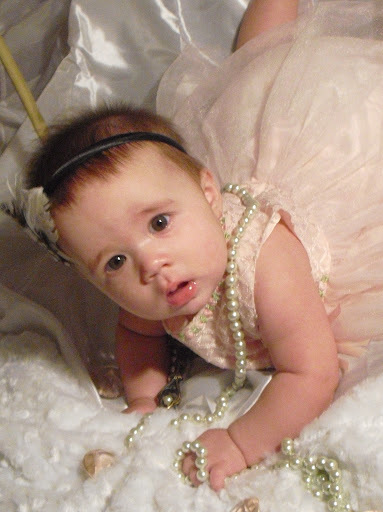 The pearls may have been the most expensive part of this shoot. About $9.00 for each strand. 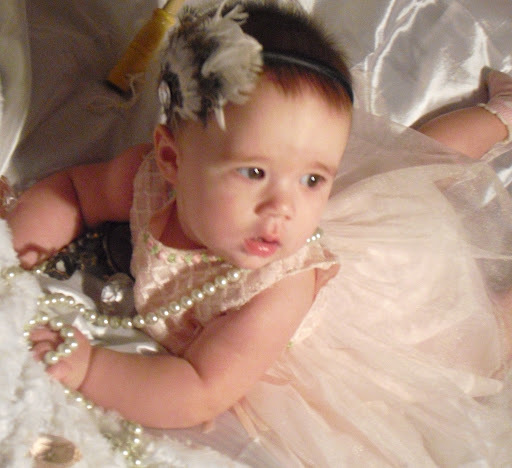 I would maybe suggest trying to find fake pearls some where or go to a thrift store for them. 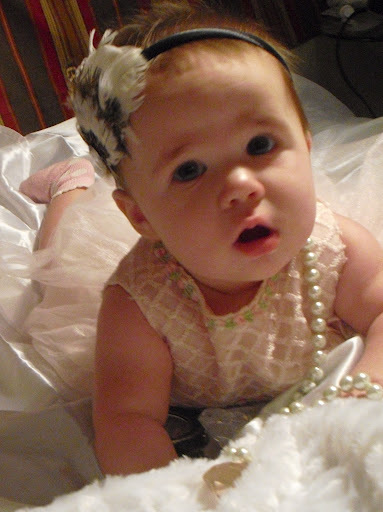 There are faux diamonds in the picture as well, though they are pink and white and don’t really show up against the white of the curtain she is laying on. We got a bunch of those for her to play with in the shot from Hobby Lobby for 99 cents a piece. They were a little too heavy for her to hold and she didn’t really interact with them much. I suppose if they had been a bolder color, they may have been worth using in this shot. As it stands, I don’t really see the point in having them. However, maybe I will use them in another shoot for something else. We got the antique mirror from Hobby Lobby as well, for about $7.00 on sale. 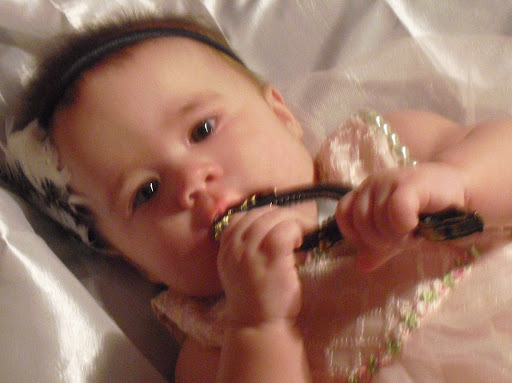 The idea was for her to look at herself in the mirror, but instead, like the teething baby she is, she ate it. Still a pretty cute picture if I don’t say so myself. My sister and I are pretty proud of our pictures altogether and these are just a sampling of what we got, but it made for the cutest little 25 week picture of Miss Peyton. My favorite weekly picture of hers to date. PS, I will probably be back for Peyton’s half birthday celebration re-cap. Can’t wait for her to be 6 months old on Friday!! random and pointless drivel from a lazy blogger who sometimes makes people gigglesnort. true story.